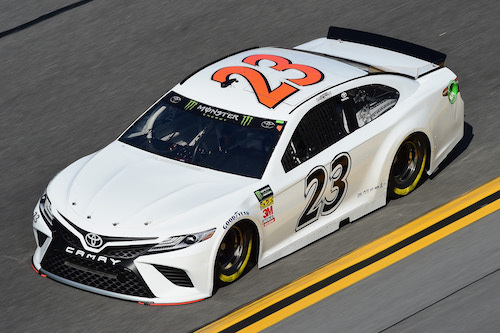 New Monster Energy NASCAR Cup Series team NY Racing and financially-strapped team BK Racing are joining forces for a single entry for Saturday night’s Coke Zero Sugar 400 at Daytona (Fla.) International Speedway. Through the partnership, they’ll field the No. 23 Toyota to be driven by J.J. Yeley, sponsored by Steakhouse Elite. BK Racing has fielded the No. 23 for every Cup Series race, so far, this season with Gray Gaulding as driver. The No. 23 fielded Saturday night through the partnership between BK and NY will use BK Racing’s charter for the No. 23 to guarantee a starting spot in the race for which 41 cars are on the entry list. BK Racing is for sale and is being run by a court-appointed trustee, instead of team owner Ron Devine, after financial troubles that include IRS tax liens, bankruptcy and lawsuits from unpaid creditors. NY Racing made its Cup Series debut in the Coca-Cola 600 at Charlotte (N.C.) Motor Speedway in May and also ran the race at Pocono Raceway in Long Pond, Pa., the following week. Yeley drove the No. 7 Chevrolet for the team with backing from Steakhouse Elite in both races.